We are among the industry veterans, engaged in offering Asafetida Powder Filling Packing Machine to our esteemed customers. These machines are painstakingly designed by expert professionals and are regarded for their hassle-free functionality. These machines fill in accurate quantities of the spices and provide high operational efficiency for the customers. 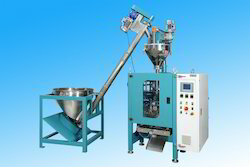 Backed by our rich industry expertise, we have come up with Pepper Powder Auto Filling Machine for our esteemed customers. These machines are designed as per the prevailing industry standards and deliver optimal performance to the customers. The offered machines prevent the product from getting wasted and package it in accurate quantities.